The Bourjois Healthy Mix Serum Foundation is a light coverage gel foundation, and one of my Top 5 Foundations. I have recently rediscovered my love for it when I realised I could do with a lighter coverage foundation for the daytime, so I went and bought a brand new bottle of my favourite light coverage foundation, and took this opportunity to do a quick review and demo, showing you how this foundation applies with a buffing brush and with a Beauty Blender. Press the play button above to watch the video or click here. I’ve spoken so much about this foundation here on the blog, so I didn’t really focus on giving you all the facts on the video above. Instead, I focused on showing how the foundation applies with different makeup tools and how it looks on my skin. For reference, my shade is 53 Beige Clair (Light Beige). If you want to read my review of this foundation, you can find it here. 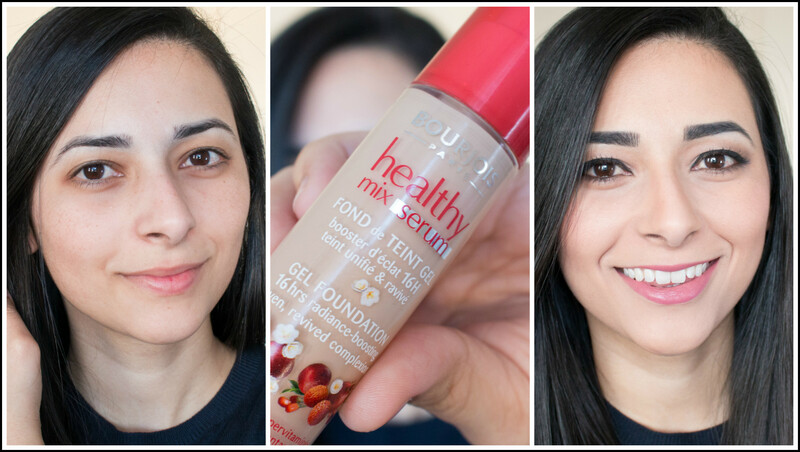 You can also read about the Bourjois Healthy Mix Serum Foundation on my Top 5 Foundations post. If you enjoyed this video, please give it a thumbs up and subscribe to my channel to be notified when I upload a new video. What do you think of the Bourjois Healthy Mix Serum Foundation? Have you tried it? I’ve wanted to get my hands on this foundation for the longest time. Bourjois foundations aren’t available in the US and I’m always a bit wary of ordering online because I can’t swatch anything before I purchase. It looks amazing on your skin – as if you haven’t got much on at all!